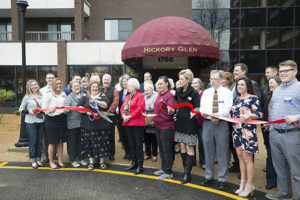 Hickory Glen Turns 30 with a Celebration! Since the day that Leonard Sapp’s vision became reality, Hickory Glen has been doing its absolute best to provide the surrounding community with a place to really enjoy their retirement years. Thirty years ago, what was then known as Oak Terrace Apartments, opened to the public. Since then there have been countless friendships started, goals achieved, and memories made all within these walls. Recently, we were fortunate enough to celebrate the 30th anniversary of this amazing community as we reminisce upon three decades of great times and look ahead to many more. We were deeply honored by those who chose to spend their time with us to rejoice in the celebration of our community, which so many have called home. 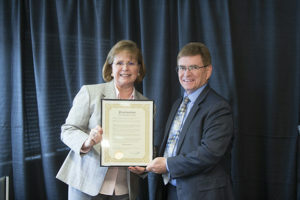 The afternoon was kicked off by a rededication from the Chamber of Commerce which included a ribbon cutting ceremony. The day was graced by a slew of guest speakers, residents, and local professionals who joined us to commemorate the past thirty years of life at Hickory Glen. Such speakers included members of the Sapp family, Mayor Langfelder, and former manager Gerry McCaffrey. 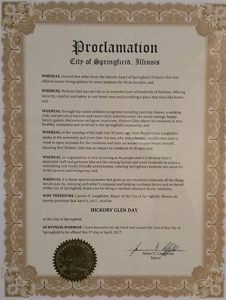 A highlight of the ceremony was the presentation by Mayor Langfelder of a certificate from the City of Springfield declaring April 5th, 2017 official Hickory Glen Day. Current manager Jill DelValley also spoke to those in attendance, as did Linda Loftus who has been a part of the Hickory Glen family for many of the thirty years. 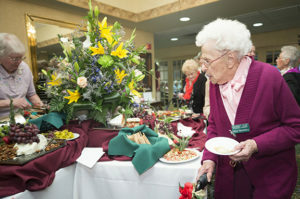 There was a festive atmosphere surrounding the day as the lobby and dining room were packed with people eager to celebrate the history and future of Hickory Glen. The event was catered by Arena Food Service and Chef Shaun Moore, who delighted guests with a beautiful array of scrumptious appetizers to wow our taste buds and a decadent dessert to top it off. Jill took a few moments to recognize and honor a handful of our residents that have been happily living here for over ten years each! Martha V., a resident here, recalls having a great time at the celebration. Citing many aspects of the event, Martha says her favorite parts were “listening to the Mayor and Sapp family speak, learning about the history of Hickory Glen, and the recognition given to those residents who have been here for ten or more years.” Another resident, Rhoda A., said that she “very much enjoyed the food, happy atmosphere, and the congeniality of all who attended the event.” Many of those in attendance enjoyed the slideshows that were set up in different rooms around the building. These featured pictures from throughout the years, so that guests could really experience the past of Hickory Glen and those who lived and worked here before. As we look back on this wonderful celebration, we can only hope and do our best to ensure that the next thirty years are just as great! Or Contact us anytime via email. Hickory Glen is a retirement community offering unique life-enriching activities with special emphasis on health and wellness. Hickory Glen offers the best value in senior living and our reasonable rents include a variety of amenities and services you won’t find in other communities.